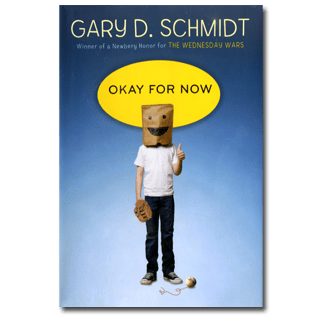 Okay for Now, by Gary D. Schmidt, is, quite possibly, the best book I’ve read all year. Read that again- not the best book written for young adults (which it is), or the best work of fiction- the best book. If there’s a contender, I can’t recall it. Okay for Now stole my heart and ran around in circles, waving it in front of the whole school and taunting me to come get it, and I didn’t even give chase. It was that phenomenal. Doug Swietick seems like a jerk. For the first few chapters or so, he complains often and gives us little reason to cheer for him. He doesn’t like his new town or anyone in it. But slowly- very slowly- we realize what made Doug that way, and I must admit, I’d be far more of a jerk in his situation. But he learns the balance of Maryville and the opportunities available to him once he starts seeing the world through the eyes of John James Audubon. Yes, like the Audubon Society. This might seem a little odd- it did to me, at first. Paul visits the local library every Saturday to view (and eventually draw- small spoiler I suppose) pictures from a book of Audubon’s work, and that struck me as a bit unnatural. But through the various expressions of birds – birds tumbling from the sky, strutting proudly, or soaring together for just a second in a strong wind- Paul finds hope and kinship in what seems to be, initially, a hopeless and friendless town. The cliche that something “made me laugh and made me cry” is rarely true for me. What brings tears to my eyes rarely brings more than a quick smile to my lips. But Okay for Now epitomized this feeling. Though it was, as my father would say, “a slice of life book” with no big adventure, I couldn’t put it down. There weren’t any plot twists. No cliff-hangers. Simply put, I didn’t want to leave Doug Swietick alone. He’s rough around the edges, but with an amazing heart – there’s definitely some Holden Caulfield in there. At first I read because I wanted to protect him, but later because I genuinely loved him. If you don’t root for Doug, you’ve probably never rooted for anyone. Really. Without being at all saccharine, Gary D. Schmidt has created one of the most lovable characters I’ve ever encountered. There’s a lot of buzz about this book, and I hear it’s got a great shot for the Newberry Award. Take this opportunity to be ahead of the curve and read it before every parent, child, teacher, book club, and bibliophile is telling you you’re missing out. You won’t regret a single minute you spend with Doug Swietick. Book snobbery: just say no. Book snobbery? Was this directed at me, specifically? Did I come off as a book snob? But was that so bad? I mean, as English majors (assuming you are reading my blog because you are, in fact, just like me- if so, let me save you some trouble; those little red spots mean you are allergic to almonds) weren’t we trained to seek out great literature and avoid cheap tricks at all costs? Everything, that is, until you see a familiar face- SpongeBob SquarePants, or Pikachu, or a puppy that looks just like yours. Suddenly, you feel at ease. Reading is not such an unfamiliar experience, and the shelves aren’t full of strangers- your friends are there. And like any good friend in an unfamiliar environment, they introduce you to new friends. They make you feel even more relaxed and comfortable, just by being there, and you realize you want to explore. Your eyes are opened to all sorts of new things. If it takes a WWE wrestler to get kids reading about World War II heroes, I’ll put those books on the shelf any day. I can support those choices. Sci-Fi, chick Lit, vampires, zombies, animals, romance, self-help, fantasy, books that came after the movie, books that are meant to gross you out, books with money on the cover… you get the idea. Man, was that limiting me. Opening myself up to children’s books- really diving in, head first, to a world I didn’t always love even when I was there- has been extremely liberating. I realized how many books I was missing, even if I wasn’t missing them. On Thursday, I flew first class for the first time in my life. I sat in the very first row, a good four rows of the business elite facing me in their oversized, reclining seats. I read Dork Diaries by Rachel Renee Russell. And I was not ashamed. after much, much searching, I finally found a job. And it’s something that’ got me incredibly. Starting tomorrow, I will be a Literacy Consultant for Scholastic. That’s right- Scholastic. Darn it, why’d I waste a “the play’s the thing” reference on the last, unrelated post? I’ll come out with it right now: I am a (recovering?) drama geek. I’ve been in over 50 theatrical products, and worked backstage… and directed… and even written a couple. I haven’t done any acting since a few student films in college, but I really miss it. Be intimidated by my icy stare.